Here's an outfit that almost everyone can wear. 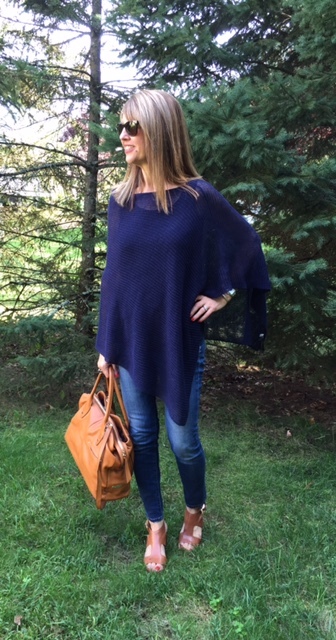 A poncho is the perfect piece for this time of the year when you need a lightweight layer for those "in-between" days. It's super versatile since it can be worn with jeans, pants, skirts and dresses...and it's a fabulous travel piece (great for the plane!). If you prefer a little looser cut jeans, try the Joe's slim boyfriend. in the same luggage color. Nail color is Tangerine by Essie (love! ).